Museo Casa Estudio Diego Rivera and Frida Kahlo is located in the south of Mexico City and is dedicated to preserving the memory of the mural and his wife, as well as the study and analysis of his artistic generation. The Museo Casa Estudio Diego Rivera and Frida Kahlo is located in the south of Mexico City and is dedicated to preserving the memory of the mural and his wife, as well as the study and analysis of his artistic generation. Commissioned by Diego Rivera , in 1931 Juan O'Gorman designed one of the first Latin American functionalist buildings: a house painter and one for his wife Frida Kahlo, where each would have his own studio one is two blocks smooth concrete, each harboring a house, a red with white (the painter) and one blue (for the artist), independent of each other and connected only by a small bridge at the top. 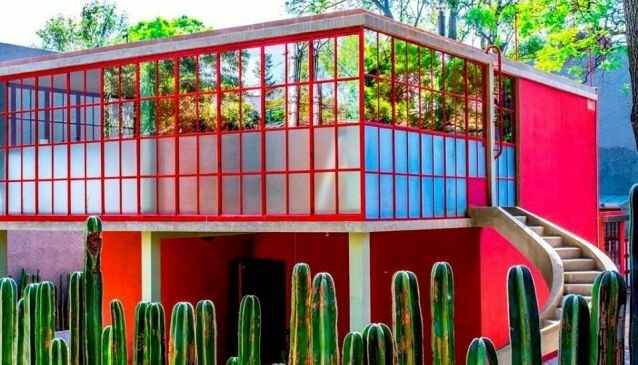 The museum-located in the San Angel neighborhood of Álvaro Obregón delegation on a surface of 380 square meters, consists of three buildings, two houses and a photographic laboratory studies designed by Mexican architect and artist Juan O'Gorman . Construction began in 1931 and ended the following year, but Diego Rivera and Frida Kahlo lived there from 1934.